Introduction and Uses: The modern Zinnias are one of the most brilliant colored annuals grown in the garden and are most suitable for cut flowers which last long. Flowers range in color from white, cream, primrose, golden yellow, orange, scarlet, crimson pink, lilac, purple to chocolate. Zinnias are suitable for growing in borders and flowerbeds. Zinnia double is grown in butterfly garden as a nectar plant. 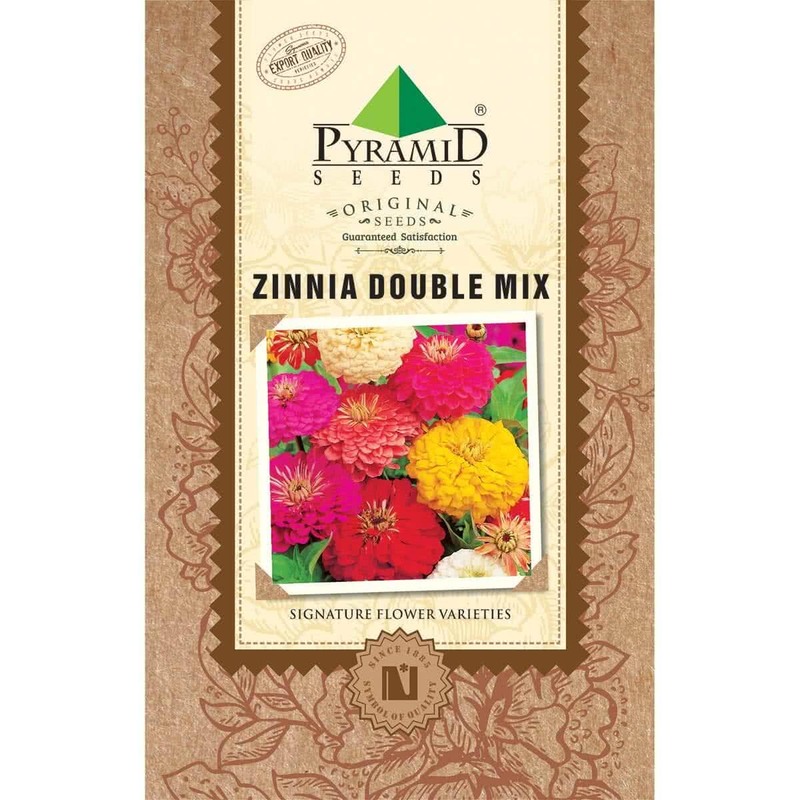 Zinnia double cut flower is the center of attraction in flower shows and exhibitions. Zinnias are best grown by transplantation method. In India, seeds can be started any time of the year. The fine sandy soil is required for seedbed (Outdoors), or coco peat is used as sowing medium for seedling trays (Indoors). When seedlings are at the 4-leaf stage, they are transplanted in pots or flower beds. Seedlings should be transplanted in well-drained soil or potting mixture. In monsoon, seeds can be sown directly in flowerbeds, and extra seedlings can be thinned out. Planting Distance: 40-60 cm apart; for pot culture 20-30 cm pots are suitable. Watering: Zinnias prefer heavy watering in longer spells, rather than by frequent light watering. 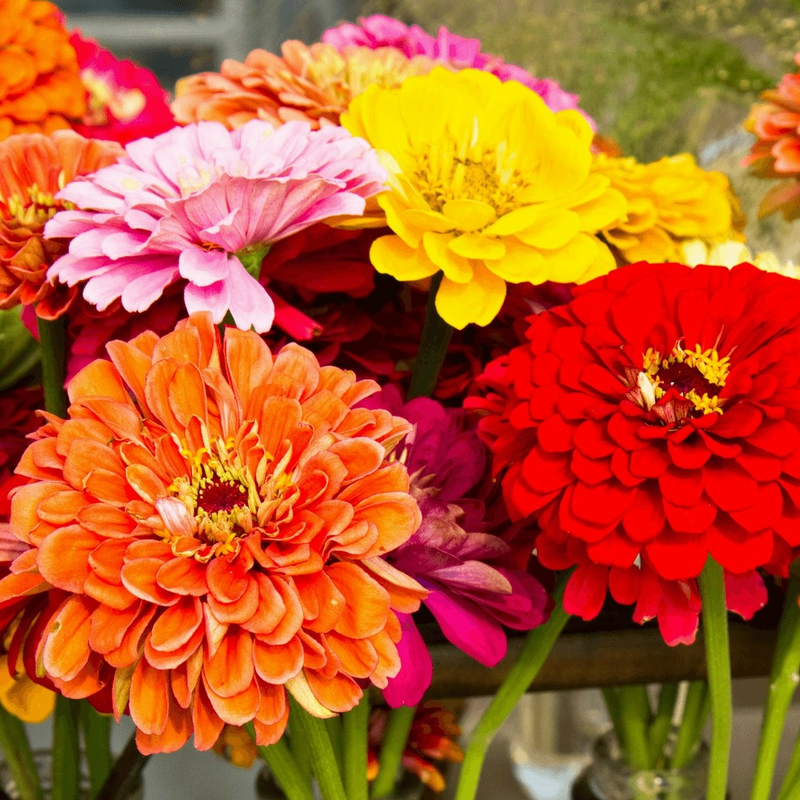 Zinnias planted in the garden should be watered twice a week, and potted ones should be watered every alternate day. Feeding: Zinnias can grow very well in poor soil with mortar from old building mixed with it, and an occasional application liquid manure made out of cow dung. Plant care: Zinnias can get affect by a viral disease called spotted wilt, as a result of which the leaves get curled. Spotted wilt is spread by thrips, which should be kept under control by a spray of insecticides. It is advisable to uproot and destroy affected plants. Click here to buy plant care products online in India. Bloom time: 1.5 to 2 months after seed sowing. Buy variety of flower seeds online. Pinching: The plants tend to flower at a young age. The seedlings should be pinched to delay flowering and make them bushy. Disbudding: The first bud of the double flowering Zinnia is of inferior quality, and hence it should be removed.